Three best-selling authors. Three possible brides. Three separate tales. They come together for an Amish wedding. Priscilla King has dreamed of being married to Chester Lapp since she was sixteen. With the help of her sister Naomi’s matchmaking skills, Chester proposes to Priscilla on her nineteenth birthday. As the wedding day approaches, problems emerge: an attendant with poison ivy, a failed celery crop, and a torn wedding dress. At the same time, Priscilla’s best friend Rose is convinced her fiancé is hiding something and she is intent on discovering the truth at any cost. Naomi remains hopeful that she, too, will soon find her perfect match. When Chester’s cousin shows up, there’s an immediate attraction between him and Naomi – as well as an obstacle that may just as immediately derail their blossoming love. Is God sending a message to stop the wedding? 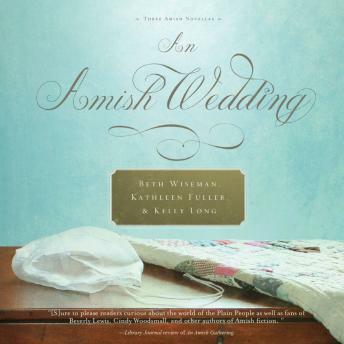 What is certain is that the hearts of these three women will be forever transformed by this touching Amish Wedding.